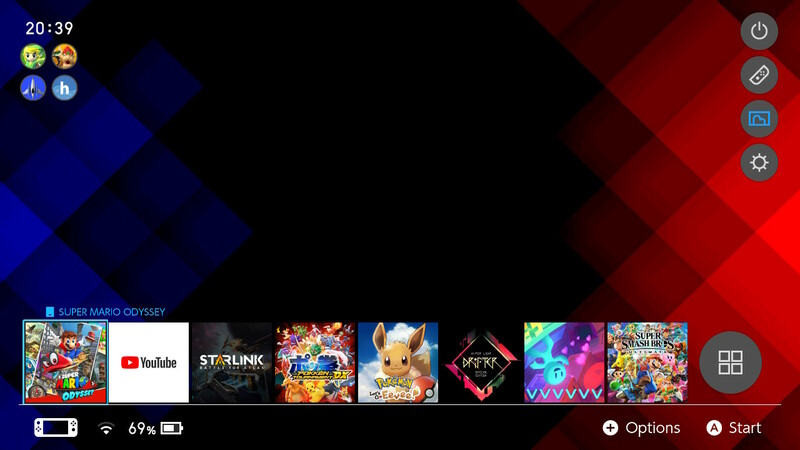 You can create unique styles and layouts for your Switch Home Menu. Follow the Making a theme section if you want to make a theme. Unzip ReleaseV3.8.zip to somewhere on your pc's drive. Open up the SwitchThemes.exe app. Navigate to NXTheme Builder. Select a Home menu part, A 720p image and a Layout patch. Click on Build NXTheme after selecting your home menu part, image and layout patch. Fill out the details in the window that pops up. After filling out this window and clicking ok, you will get asked where to save the NXTheme file. Save this file to a temporary folder. Repeat step 3 and 4 for every Home Menu part of the Switch you want to modify. You will need GIMP installed, as well as the gimp-dds plugin. On Windows it can be downloaded from here and on Linux it should be installed via your package manager. Use your package manager to search for gimp-dds. After both of these are installed, you will be able to export your image in the .dds format. Alternatively, you can use a dds conversion site to convert an png image to dds. Make sure all of your images you convert are 720P! Select a custom layout patch, a theme name and an author name, then click build NxTheme. If you want to use the homebrew app store for themes, you can simply install the theme you want via the appstore, and follow the instructions from step 2 onwards below. Copy the .nxtheme files to the themes folder on your sd card (It is recommended you put them into their own folders, e.g. /themes/awesome_theme/awesome.nxtheme).. Create the themes folder on the root of your sd card if it does not exist. Boot Switch CFW, launch the Homebrew Menu and launch NXThemes Installer. Your theme files should be listed here. You can install them one by one. Reboot your switch to see the changes. Put a font in the .ttf file format into the themes folder (It is recommended you put them into their own folders, e.g. /themes/cool_font/font.ttf). This is probably due to the archive bit being set on either the app or the nxthemes. This is usually the result of copying files to an sd card via a Mac. If you are experiencing this issue, try resetting the archive bit via Hekate for all files.